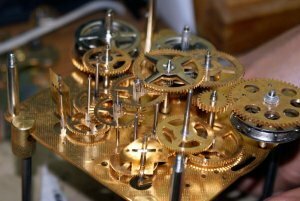 Clock Depot – Grandfather Clock Repair – We come to you! Is your grandfather clock broken? Or maybe its just time to clean and oil your clock? We have been servicing clocks since 1968. We are the premier grandfather clock service company in the upper mid west. We come to you! We have been servicing clocks since 1968. 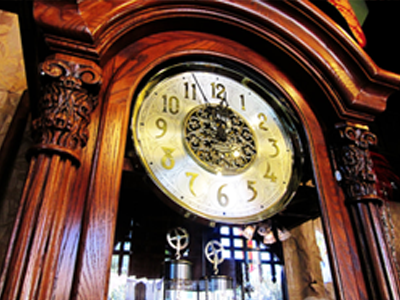 We are the premier grandfather clock service company in the upper mid west. This is our 50th year in business and we’re proud of that. Every year our service coverage area seems to get larger and larger because there are fewer clock repair shops outside the major cities here in central Minnesota. 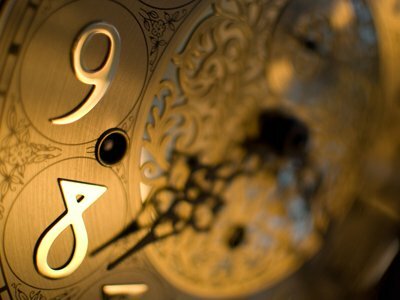 Our Grandfather clock repair business was founded on one main principle. That is, In-home clock repair. It is asking too much of someone to have to bring their clock into our shop. Grandfather clocks are too large and too delicate. Customers love the convenience and the service of having us come to the clock. Yes, We Pack and Move Clocks! doesn’t matter whether you clock is too large or too delicate to move… we have the experience and the tools. Manufacturers agree, Clocks not only need to be properly cleaned and oiled every two years but they recommend this service should be completed by a professional. It is too easy for the average customer to miss something critical while doing it themselves. Clock Depot makes it easy. We send out letters every two years to all of our customers. You’re gonna love the convenience and the service! I’ve known Dan for a long time and you can count on him to take care of your clocks. Dan came to my home to service and clean my Grandfather Clock. He was very kind in assisting me with understanding the ins and outs of maintaining a Grandfather Clock so that it runs perfectly forever. I will be working with him well into the future. The technician helped my parents with their clock. He was very knowledgeable and patient. I just love how he went to their home and didn’t make them bring their clock in. The service and price were great. We had our grandfather clock put together in our new home by the technician Dan, and he did a great job. He was very knowledgeable and set it all up properly for us, and showed us how to keep it running. Appreciate the extra time he spent making sure we were comfortable taking care of the clock. Type your data in the form bellow to contact us. You're gonna love the convenience and the service!